I've banged on about this before and probably will again but I just wanted to have another moan about the extortionate price of fresh herbs in supermarkets. 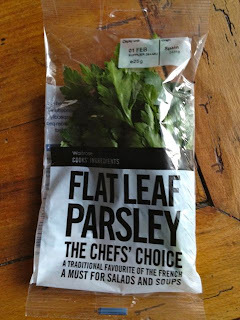 Witness this 25g bag of flat leaf parsley that was on sale at Waitrose yesterday for 89p. That's £35.60 a kilo, more than the cost of fillet steak. I can buy a bunch roughly 10 times that size from my local greengrocer for just over £1 and so, I'm sure, can you. It's really time supermarkets stopped ripping us off. That said I did find quite a useful product in the frozen cabinets as part of Waitrose's Cooks Ingredients series which was a pack of Thai mix - a mixture of lemongrass, coriander, ginger, chilli and garlic - which would be quite handy to keep in the freezer. It won't pack quite the punch of fresh ingredients but is probably more economical than buying them individually, certainly for a single dish. Normally £1.49 a pack at the moment they're on offer at 2 for £2.50. You can also buy frozen coriander that way. 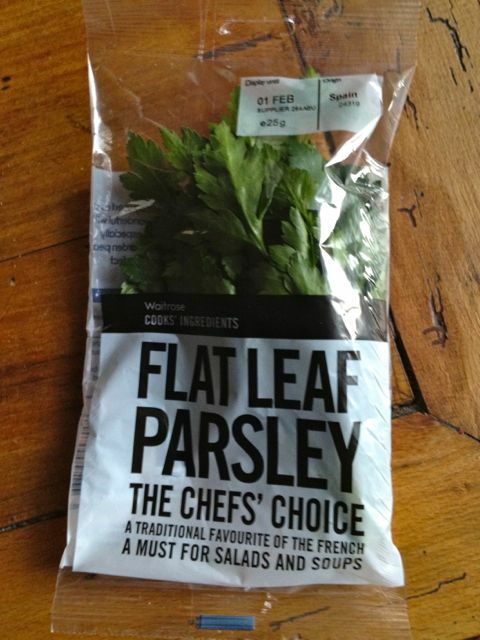 Do these pesky packets of fresh herbs annoy you too or is it just me? Booths also seem to have some good whisky offers with £10 off a number of leading malts including Ancnoc 12.y.o. and Old Pulteney 12 y.o., though they unhelpfully don't say what the discounted price is on their site. Apart from Isle of Jura 12 y.o. which is down to £20.95 from £30.95. And Lidl has a decent own brand whisky called Hunter's Glen (yes, naff I know but it's fine) for £11.99. 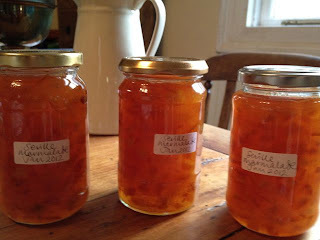 I’m not a great one for ‘the perfect this’ or ‘the perfect that’ in recipes but if you’re a marmalade aficionado I promise you this is as good as it gets. Intensely fruity, thick and sharply flavoured. OK, I’m biased. It was my mum’s recipe so it carries a bit of emotional baggage. I can remember the kitchen filling up with a warm, comforting marmaladey fug and sitting alongside her as a child slicing the oranges. She wasn’t a wonderful cook but this was her pièce de resistance. I still have the original written neatly in blue ink on a piece of Basildon Bond notepaper. I’d got out of the habit of making it but she died just after Christmas so I wanted to make it in memory of those companionable times. Besides seville oranges are in season so now’s the moment. 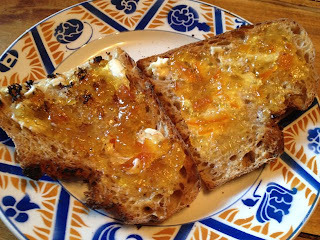 First a few practicalities to keep down the cost because you can of course buy marmalade much, much more cheaply than it will cost you to make it. But it won’t taste anything like as good. * Assuming you don’t have a preserving pan you need a large saucepan. A large stainless steel pasta pan is perfect. The bottom of a pressure cooker will do. * You need jars. You can buy them from sites like Jam Jar Shop but that does add to the cost so beg or borrow some from neighbours. Not pickle or chutney jars in which the smell of the previous contents tends to linger. The jars need to be as clean as possible. Old recipes suggest sterilising them by putting them in a hot oven but I find a recent run through the dishwasher will do the trick. * You need waxed paper discs if you’re to keep the marmalade any length of time. And labels. Again from a specialist like Lakeland or the Jam Jar Shop. * and finally, and most importantly, you need seville oranges, unwaxed lemons and sugar in the following quantities. The original recipe states preserving sugar but this is now so hard to get and twice as expensive as granulated so I would (and did) use that. No problem. This makes about 7-8 400g jars but your jars will probably be all shapes and sizes and the quantity always turns out different depending how long you boil the marmalade so make sure you have slightly more than you need. 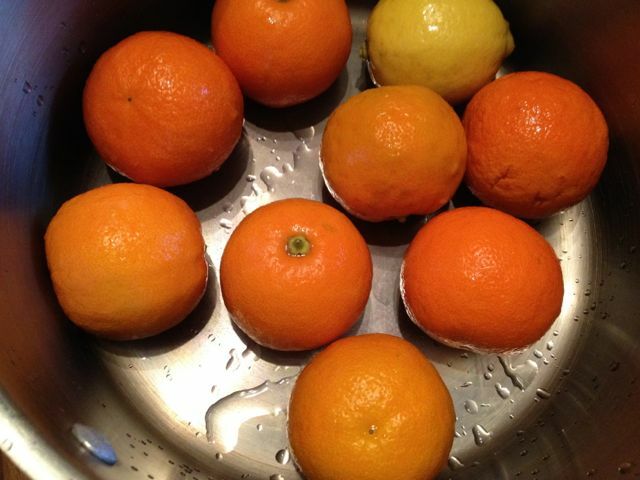 Wash and scrub the oranges and lemons with a vegetable brush and put them whole into a large pan with 1.3 litres (2 1/4 pints) of cold water. Cover the pan with a lid or a large sheet of foil and bring slowly to the boil. Simmer for 1 1/2 to 2 hours, turning them occasionally until they are soft enough for you to pierce the skins with the end of a teaspoon. 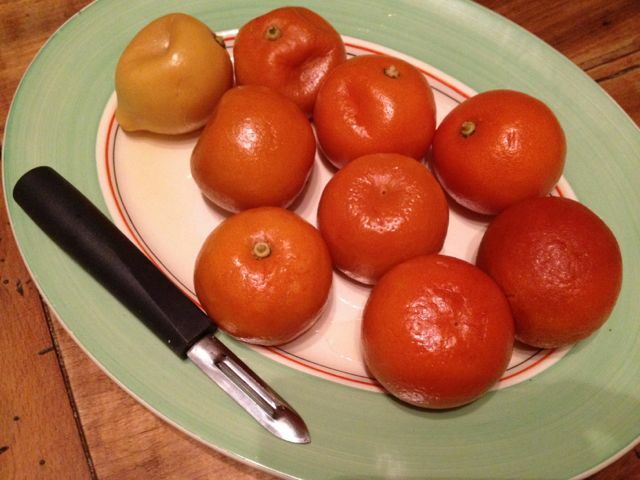 (You can probably remove the lemons after an hour and the oranges progressively after that). The kitchen will smell heavenly. Remove the fruit and measure the remaining liquid. If there is less than 1.1 litres (just under 2 pints) add enough fresh water to bring it up to that level and return to the pan. Tie up the pips in a piece of muslin (there’s a useful video here) and hang it over the handle of the pan and into the cut up fruit. 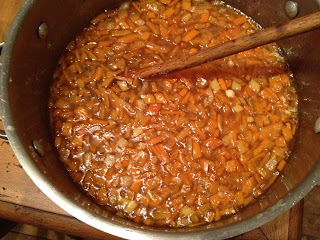 This might seem a bit of a faff but the extra pulp and pectin helps the marmalade to set. Put the sugar in a warming drawer or very low oven to warm up. Bring the fruit up to boiling point then remove the bag of pips and squeeze and scrape the outside of the bag to release any remaining pulp. Add the warm sugar to the fruit and leave over a low heat, stirring occasionally until dissolved. Bring back to the boil and boil the marmalade for 25-30 minutes, stirring occasionally to prevent it sticking. Skim off the thick yellowish foam that forms round the edges from time to time. Test a little on a chilled saucer after 25 minutes to see if it’s set. It should crinkle when you push it with your finger. If it doesn’t continue boiling it until it does. As the marmalade reaches setting point it will darken and grow thicker. Once the marmalade has reached setting point, remove from the heat, skim off any remaining scum and allow to cool for about half an hour. 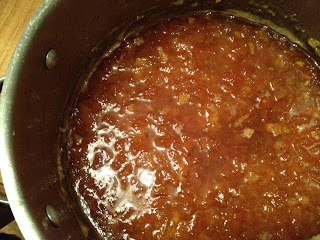 Warm your jars if they’re not already sitting in the dishwasher and ladle or pour the marmalade into them (I find a small jug is easiest for this). Cover with a disc of waxed paper, if using, and seal with screw top lids or clear covers. Wipe any splashes off the side of the jars while they’re still warm. Leave until cold before labelling otherwise the labels won’t stick. 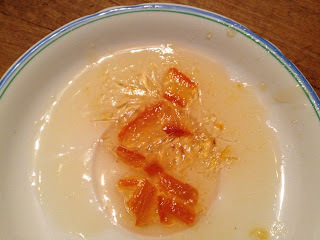 You can of course cut the amount of work involved by mincing the peel but I like proper looking chunks in my marmalade. Just get someone to sit alongside you as you do it. It’s a nice thing to do with your kids, a mum, gran or sister or a friend. Actually my husband helped me with this batch while we listened to Bob Marley. Good marmalade music. Oh, and a final tip. You can freeze seville oranges successfully if you haven’t time to make all your marmalade in one go or run out of jars. Just wash and dry them before you freeze them, use them from frozen and increase the boiling time until they’re cooked through. 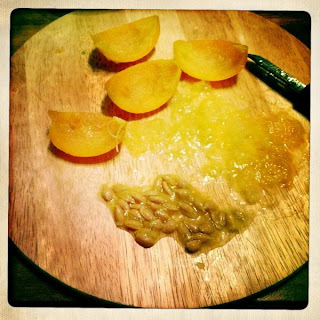 Is this how you make your marmalade or do you reckon you have a better version? 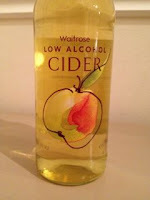 If you're finding it hard to give up booze for the month you might want to snap up a bottle or two of Waitrose's low alcohol cider which is only 1% ABV. Now I'm not saying it's the best-tasting cider ever - it's a little too thin and too sweet, for my palate at least* - but it does taste recognisably like cider in a way that apple juice doesn't and if you were drinking it with roast pork, a chicken casserole or even a nice hunk of cheddar it would rub along fine. It's actually made in Herefordshire in old oak vats so I'm guessing it probably comes from Weston's. The price is pretty attractive too. It only costs £1.15 a 500ml bottle - online at any rate. I somehow ended up paying £1.21 for my bottle in store, maybe because it's classified as a 'Little Waitrose'. Not a huge outlay anyway. * However my neighbour who just popped in tried it and said 'really nice'. So there you go. I should also have pointed it's 180 calories a glass so it's not exactly a low calorie option - though not much more than a large glass of shiraz. 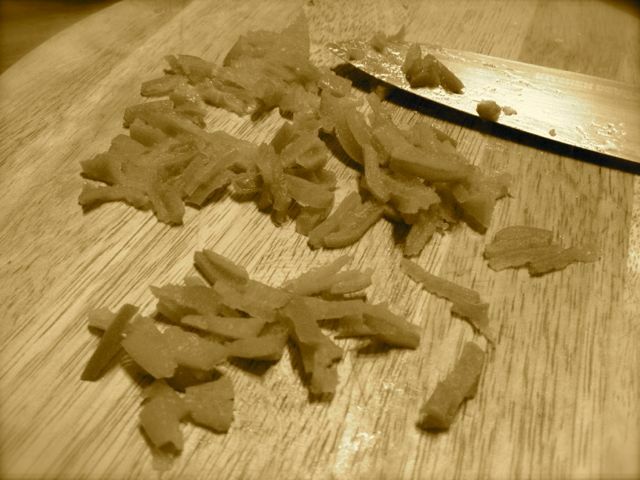 Following yesterday's post the good news is that my student cookery site Beyond Baked Beans is back up and running but at a new domain name www.beyondbakedbeans.org. If you link to the site please change your link. And if you don't, do link to it which will help students - and other first time cooks on a budget - find it more easily. What's happened to Beyond Baked Beans? Due to my inattention and a mix-up on who should renew the domain name it's expired. Someone else has snapped up the name and is running ads on it. It was never a moneymaker so I can't afford to buy it back. The domain registration site GoDaddy even wants to charge me commission for finding the buyer (surely they know?) and negotiating a sale. On top of a fee. I can't afford to pursue that. It's a sad day. The site, which was founded at the same time as my first cookbook came out in 2003, has been going for over 8 years, encouraging students to cook and eat healthily. But it's not all bad news. * The books - Beyond Baked Beans, Beyond Baked Beans Green and Beyond Baked Beans Budget are still around and available for next to nothing on Amazon. Plus there's a full-colour illustrated compendium of all the best recipes called The Ultimate Student Cookbook which also contains recipes from three of our ex-students James, Sig and Guy. * Plans were already in hand to pass the website over to the students of Bath Spa university to give it a comprehensive makeover. I'm sure a better, more interactive site will result. * And there are plenty of simple, low-cost recipes here on this blog for students or anyone else on a budget. But it's a useful warning if you have a site of your own - don't ignore reminders about domain name expiries and make sure the credit card you pay with is up to date. And if you're the person who bought the site, just think about it. The site helped many young people to learn how to cook. It would be nice if you gave it back.